emmatree: it is magic, it is enchanted, it is charming. It is full of spirits in the shadows and hidden hearts and flowers that bloom in the dark of night, and it speaks its own language. If you are lucky, if you stand under midnight skies and listen for owls and watch the wind move the clouds, you will learn to speak it back and a conversation will begin. It is not a fairy tale. It is real. The sidewalks are sometimes too hot to stand upon. There are bits of squirrel-tossed pecan shells hidden in the grass that make walking in bare feet a game of tiptoes and swearing. There is crime and annoyance and too-loud cars at 2 a.m. In the last heat of a hot dry summer, it looks tired, exhausted, dusty. When you turn the corner onto the block, you would never know, if you didn't know, that you are stepping into magic. There is no doorway, no gate, no sign to alert you. It appears so ordinary. And yet. The color of the air each morning is different than the color of the afternoon. Stand still for a moment and there is a bird flying through the shadows at your feet - your muse teasing you, playing games with the leaves and the golden breeze, tickling the tips of the monkey grass. 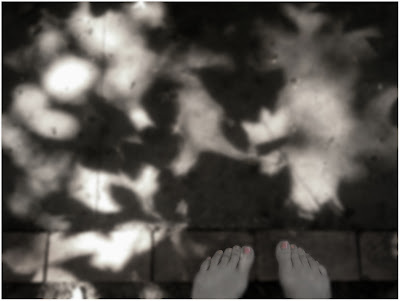 You cannot say dappled enough when describing these days; they are that dappled. Your toast is the shape of the almost full moon, and you butter it and swallow the moonlight for supper. It is so ordinary. It is not a fairy tale. now that's just damn profound and i love it ! Aren't we so unspeakably lucky when we find those places?! Thank you! Dearest Debi, this is such a beautiful photo and words are so magical ~ it feels like a fairy tale. Have a lovely merry happy day and love to yoU! and yet, it is so not ordinary, the same way that your writing, even when it is about ordinary things is not ordinary, it is magical. but not a fairy tale. and that is perfect. your writing is delicious. ~swallowing the moon for supper~ You wreck me....have a beautiful week! excellent. i love the early morning and late evening light equally. the in between parts, not always as much. It's not a fairytale. It is real. But, it's the magic in your vision, your eyes, that makes life a living, breathing, fairytale.